RedSn0w v0.9.15b1 allows you to easily downgrade A4 iOS devices as long as you have your SHSH blobs and AP Tickets saved. One new feature in RedSn0w v0.9.15b1 however, is the ability to re-restore A5 iOS devices (iPhone 4S, iPad 3, iPad 2) to the same 5.x firmware or even downgrade to a lower 5.x firmware version. The only requirements of this procedure are that you have saved SHSH blobs for your current 5.x firmware as well as the 5.x firmware you are trying to get to, and that you did not get to your current 5.x firmware using an Over-The-Air (OTA) update. Unfortunately if you upgraded your A5 iOS device to the iOS 6 firmware there is no way back down at this time. The only exception to this is for the iPad 2, but it requires you to have saved SHSH blobs on the iOS 4 firmware generation. A4 iOS devices can of course downgrade for life from whatever firmware they have saved SHSH blobs for. In this specific tutorial you will learn how to re-store your iPhone 4S, iPad 3 or iPad 2 from iOS 5.x to iOS 5.x using the Mac OS X version of RedSn0w v0.9.15b1. Step 1) The first thing you will need to do is download RedSn0w v0.9.15b1 for the Mac OS X operating system using the download mirror below or through the iJailbreak Downloads Section. You will also need to download your iOS device’s current firmware and firmware you plan on downgrading to, which can also be found in the iJailbreak Downloads Section. Step 2) Once you have downloaded RedSn0w v0.9.15b1 you will need to launch it by double clicking on the Redsn0w app. 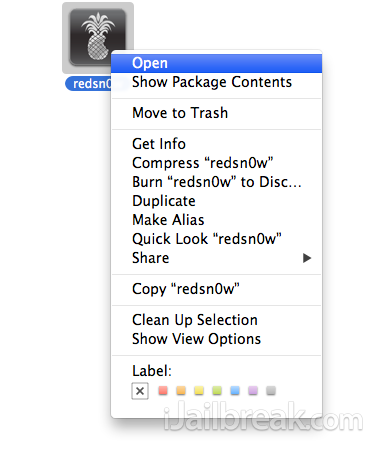 Keep in mind that to launch RedSn0w on OS X 10.8 Mountain Lion you will need to hold down the control button, click the RedSn0w and then click the Open option. Step 3) With RedSn0w up and running you will need to simply click the Extras button, followed by the Even More button. From the Even More menu click the Restore button. 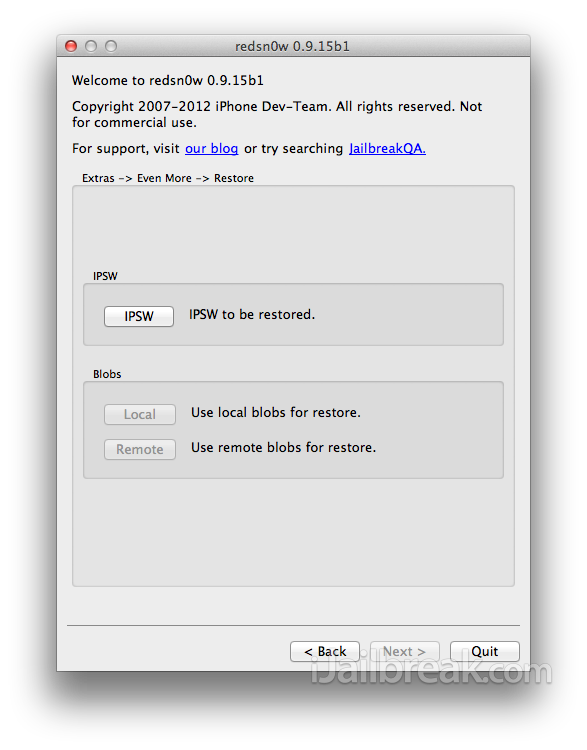 Step 4) Now click the IPSW button and select your iOS device’s firmware that you plan on re-restoring/downgrading to. If you have not yet plugged in your iOS device yet, you will also be prompt to do this now. Additionally, if you are required to select another firmware file RedSn0w will alert you (this is only required if you want to downgrade to a lower 5.x version than you are running right now). Step 5) After the firmware selection process is over, you will need to select your SHSH blobs. This can be done locally (if they are saved on your computer) or remotely (if they are saved on Cydia’s servers). Once you have selected the appropriate SHSH blobs RedSn0w will stitch everything together, put your iOS device into Recovery Mode and then restore your device to the chosen firmware version. As long as you had the right SHSH blobs, this process should have given you no troubles and your iPhone or iPad should be re-restored to the desired 5.x firmware. If you have any further questions or thoughts please turn your attention to the comments section below. I do not have 4.x.x blobs as my ipad 2 didnt come with it, is it possible to restore to 5.1.1 or 5.0.1 ?? Nope. Unfortunately, it’s only the 4.x.x SHSH blobs that makes the downgrade possible on the iPad 2. It says signing window is closed, is there any bypass for that? my iphone 4s is on 5.0, but I only have blobs for 5.0.1 and up. I’m trying to upgrade to 5.1.1 through redsnow but it is asking me for my 5.0 blob. is there anyway around it?